﻿ საქართველო Georgia, გიორგი ყველაშვილის ვებსაჲტი. ვებგვერდი "საქართველოს გეოგრაფია"
Georgia is comfortably ensconced alongside the east coast of the Black Sea. The country is pampered by the warm and pleasant climate provided under the protection of the Greater Caucasus mountains. Standing graciously along the entire northern perimeter to ricochet a cold weather from Russia_ a northern neighbor_ these magnificent mountains, a domain of picturesque perennial glaciers, verdant alpine meadows, hulking evergreen forests, scattered historic villages with medieval fortresses, and unique wildlife, are tallest in Europe. On the other hand, the Lesser Caucasus mountains located on the southern part of the country, although modest in height, are luscious and multifaceted alike. They secure this nation against the arid climate found in most parts of Turkey, Azerbaijan and Armenia _ southern neighbors of Georgia. Do you fancy climbing, hiking or at least cooling off in mid July and August? Well, a few-hour trip can transfer you from suntanned beaches at the Black Sea up to the niveous mountains pleasantly cool in summertime. Those who favor skiing will find the same mountain slopes even more attractive in winter: Georgia is a boon for skiers. Lovely ski resorts are like patchy hamlets in the hillsides, many with stylish hotels. All four European seasons are so meticulously observed in Georgia that a single day can make a huge difference. There are a plethora of rivers meandering throughout the country, with Mtkvari on the East and Rioni on the West being the largest. Lakes and glaciers are other beauties available in the mountains. The subtropics along the Black Sea harvest in lemons, oranges and tea and the rather dry eastern part of the country is renowned for its vineyards and fine wine. 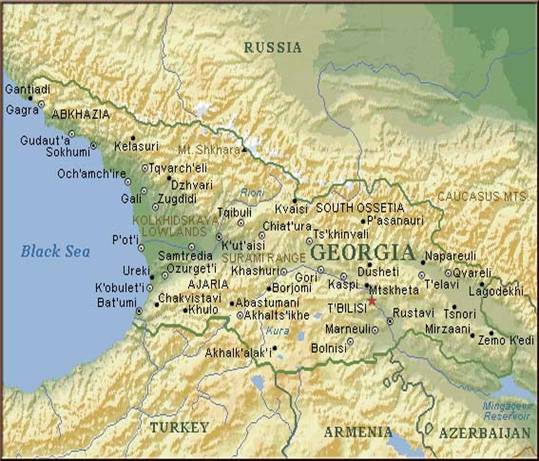 Presumably, Georgia emerged as the cradle of wine agriculture. Ancient ceramic jars and amphorae excavated in different parts of the country, illustrate coherent features uniquely characteristic to Georgian pottery as well as winery. Speaking of excavations, the latest sensational discovery of the Georgian archeologists, a well-preserved fossil skull should be mentioned. this so called 'Georgia Skull' is dated at 1.75 million years old and presumably belongs to a female Homo erectus. Before this discovery, It was considered almost axiomatic that the homo sapiens was first, and on all accounts, only hominid ever to leave Africa. We can't help but proudly and graciously conclude that even in those prehistoric times, Georgia was so coveted and its climate so salubrious that a homo erectus prematurely ventured for this country to escape a monotonous African landscape. "Eh, well, temptation has to be slaked". This saying by all means was passed on to us by the very precocious ancestor. Georgian Orthodoxy is the Main Religion. Historically diverse and heterogeneous, Georgia with a total population of around 5.5 million, has been traditionally divided into several provinces, each with a distinguished and very characteristic background and unique features: Lying astride the Likhi Range, the country both geographically and culturally is dichotomized into Western and Eastern Georgia. 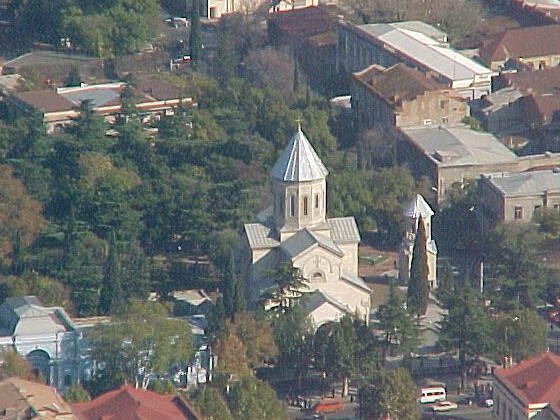 Kartli and Kakheti constitute the eastern part of the country. Apkhazeti (or Abkhazia), Imereti, Samegrelo, Guria, Achara, Svaneti and Racha make up the western part. 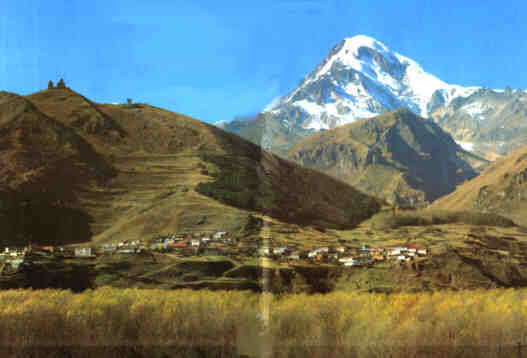 Samtskhe-Javakheti is on the South. 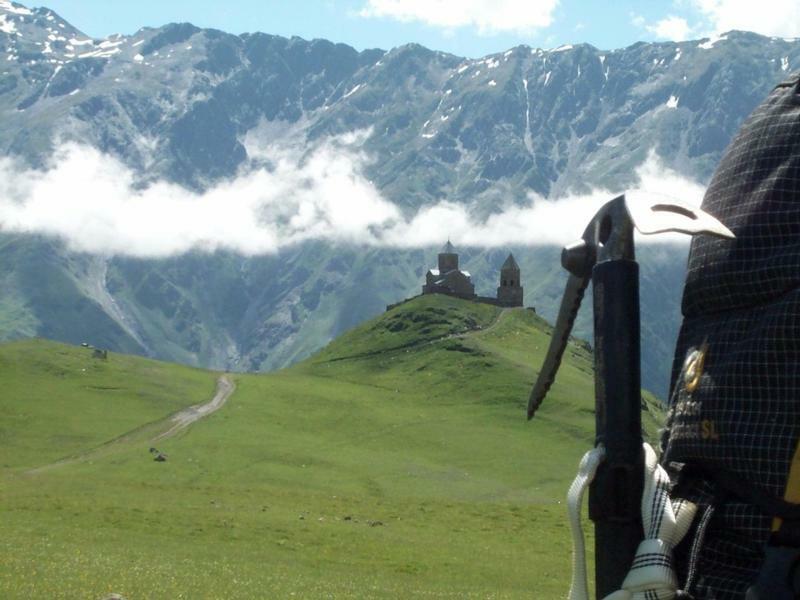 Mtiuleti, Tusheti, Khevi, Khevsureti, Pshavi create the eastern mountainous moiety of Georgia. In spite of the different vernaculars and dialects, all these regions share the common Georgian literary language which has only slightly changed since its origin. Georgians boast about their literary tradition of 2000 years. Tbilisi, the capital, is the largest and most populous city of the nation with more than 1.5 million residents. 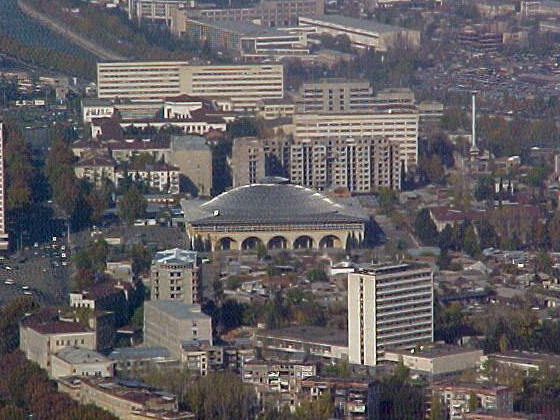 Kutaisi, Rustavi, Sokhumi and Batumi each have populations of more than 200.000. Showing a traditional tolerance to other religions, most Georgians belong to the Georgian Autocephalous Apostolic Orthodox Church. Though, Muslim, Judaist, Catholic and protestant Georgians are not rare. Dedicated hospitality is another shareware of all Georgians. Traditionally, a guest is hosted and treated as God's messenger and all the best is done to accommodate, feed and amuse him or her. Don't be surprised if a Georgian cadges you to help yourself to some more wine or food. Wine is the main drink at Georgian table. A party called supra is highly organized and formalized with a toast-maker i.e. tamada in charge, though, any request to raise a toast especially by a guest is welcomed. Many types of wines are produced: red, white, dry, semi-dry, semi-sweet, sparkling, etc;. Anticipate that your host may sometimes commend his own wine to an excess. Toasts, mandatory attribute of the supra, are superbly romantic and spiritual. Respect to a lady and an elderly is routinely observed at table. A courtship bears rather spiritual characteristics. The Western tradition of 'boyfriend and girlfriend' in its sexual sense is not accepted by the common Georgian culture. Unmarried virgins in their 30's and 40's are commonplace even in high class society. Dating someone without nuptial intentions is rare. A friendship between a boy and a girl, and a man and a woman 'like brother and sister' is usual, especially at schools, universities and workplace. A manly friendship is very strong and friends are frequently considered as family members. An elderly benefits from superior attention and respect. Education has always been a top priority in all strata of Georgian society. Currently, a Georgian family is mostly small: two, three children at most; one child in a family is not rare. A respectful attitude to grandparents and seniors is being instilled in children right from birth. Grandparents play an exclusive role in rearing youths and shaping minors' personalities. They frequently baby-sit for their grandchildren. An interest in politics is very noticeable. Not seldom can you notice Georgian men and women discussing domestic and international politics somewhere in the countryside. Georgians love sports, primarily European football. They make good fans of their native sports clubs. Most common sports apart from football include basketball, wrestling, rugby, chess... Gambling acquires speed and Georgians are keen gamblers. Hunting and picnics are other favorites. Polyphonic Georgian folk songs and traditional dance have been preserved even in young people's everyday life to such a point that almost every Georgian is an amateur folklorist. Modern Georgian and western music is highly appreciated. Georgians are extremely curious and gregarious, socializing and adapting very easily. On the other hand, being notoriously nostalgic, hardly can they live outside their own country for a long time. Georgians are good cooks and gourmets. Due to the outstanding Georgian cuisine, they appraise fine food and are not easily ingratiated with exotic foreign dishes even if they politely claim to. Being extremely individualistic, Georgians are sometimes rather restive, temerarious and recalcitrant. Moral values, rather than laws make them obey. That's why authorities have always had some difficulty in holding the country under control. These features had been a boon for self-survival while resisting historical adversaries and foreign intruders but the excessive individualism is getting rather troublesome and dangerous nowadays when the country is establishing a modern democracy and the rule of law.